Our Annual WHCS Benefit Concert raised 1906.73! Thank you to all our donors! Click here to see the Gleaner article celebrating Mrs. Conrad's 25th year of service! Click here to see the Gardner News article celebrating Mrs. Conrad's 25th year of service! A huge thank you to all who contributed to the WHCS Benefit Concert. We took in just a little over $3000! God is good. In celebration of National School Choice Week, we were honored to have the City of Gardner's Mayor Mark Hawke as our guest speaker. Scroll down to see the photos below! We have to assume that if you are here, you have already noticed our all new, totally revamped web site! For your convenience, you now have the option of registering your student online and/or pay your school fees online. We hope these changes will make our site more user friendly as well as convenient for you. Some more good news! The Southern New England Conference has added another $100 per semester to the 3-way plan, bringing the total available assistance to $1400/year. To access the application form, click here. Check out our library of over 3500 volumes. We are committed to adding to it yearly. Our younger kids are enjoying the new sandbox created by our Men's Ministry group! 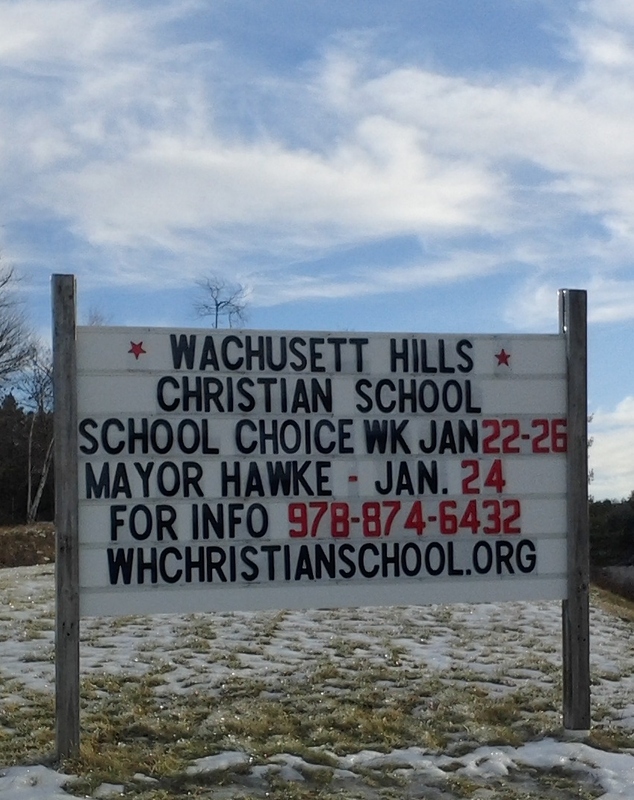 Did you happen to see the brand new sign advertising our school on the corner of Rt. 140 and the connector road to Colony Rd.? It's pretty hard to miss! Great news! Increased enrollment has allowed us to add a second teacher and a kindergarten program. Please welcome our new upper grade teacher, Mrs. Heather Bell! We have added 7 new computers and 20 tablets to our school inventory. We also got a new projector for the lower grade classroom. This was made possible by the $5000 technology grant that we were awarded. The credit goes to our principal who was responsible for submitting the application for it. Thank you Mrs. Conrad! We have added a camera monitoring system to assist in the safety and protection of our students. We have upgraded to a state-of-the-art internet security filtering system to provide our children with a safe and healthy online environment. ...and equally riveted on the chorusters as well! Awesome job by the choir! The kids had lots of questions.